For the past 25 years, Chester County Planning Commission Graphics Specialist Polly Chalfant has been able to use her design and communication talents to transform technical information to a more visually appealing and user-friendly format. “I’m a designer/illustrator, so I’ve been able to use my skills to design documents and reports and, even last year, to help redesign the website,” she said. Polly said design is about bringing solutions to problems. “I love to help a planner communicate a vision,” she said. Polly studied commercial art at the Hussian College School of Art in Philadelphia. She majored in painting at the Pennsylvania Academy of Fine Arts in Philadelphia. She started her career with freelance design and illustration. She also worked part time at the Chester County Library and then applied for a full-time position at the Planning Commission. She has enjoyed many projects over the years but some of her favorites include redesigning annual reports and leading the design of Landscapes2, the county’s current comprehensive plan. She changed the previous format of the annual reports to one that tells a story and celebrates accomplishments. She said this set the stage for the design of other documents in this office. She is currently working on Landscapes3, the county’s next comprehensive plan. “I’ve had my hand in so many of the products that have come out of this department,” she said. Polly has experienced changes with her job over the years due to technology. She said computers have assisted immensely with design and research. For instance, she used to research what some things looked like at the library before she illustrated them. Nowadays, Google provides those answers instantly. “A great thing about working for the county is the training, so that has completely kept me up to standards,” she said, referring to technological changes. Polly is a Chester County native and has a strong appreciation for this county. She believes the Planning Commission’s mission supports all the important aspects of the county. In her free time, she creates artwork and shows regionally. 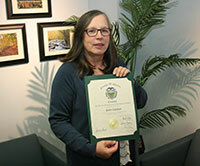 She has won awards for her work and recently showed in the Chester County Studio Tour. The Chester County Commissioners honored Polly, Graphics Supervisor Diana Zak, and employees from other departments who have worked for the county for 25 years during a meeting last month.